1st Runner-Up Best Puzzle Game of 2008! 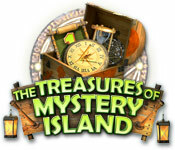 The Treasures of Mystery Island is rated 3.5 out of 5 by 11. Rated 5 out of 5 by listenerstone from Great Old Game I actually got this as one of many bonus games when I bought a completely different title on a disc. And it quickly became my favorite game on the CD; even more than the one I meant to buy. 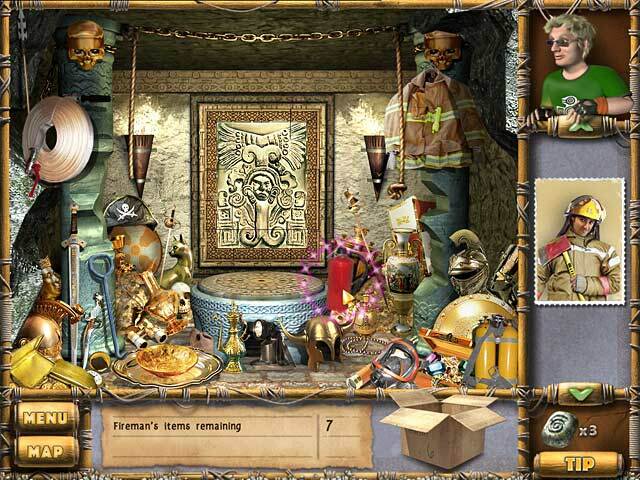 This is a fragmented hidden object game, which is a nice twist from the usual. There are some mini-games, but none of them are that hard and most have been seen in some form before. Still, that didn't detract from how much fun this game really was. Some of the objects were a little difficult to find, but most could be discovered with a little bit of perseverance, as the graphics are fairly decent. And there is a clue available that takes only a short while to recharge. There can be a bit of a challenge sometimes in figuring out exactly what to do, but if you switch from location to location on the map, it can definitely be figured out without using a hint. And the character you play as, Alex, will generally prompt you with dialogue if you get stuck and start clicking on what you think you should be doing. There are cards that you collect as you move through the game, but they aren't hidden in a location. Instead, they a part of a HO scene which you go to after completing all other tasks on each level. They are objects pertaining to whichever profession the card displays; for example on one level you search for objects a doctor or a soldier might use. The storyline is pretty good, even if a little fantastical, and is interesting enough to follow on your first time through. Almost every scene is skippable, if listening to dialogue isn't your thing. I definitely liked this game and found this one to be a hit. Even after all these years, I still enjoy playing it, so the replay value is pretty high for me. As it is an old game, give it a try if you're looking for something to use a game credit on. Definitely worth it! Rated 5 out of 5 by Little_Joe1 from Great Fragmented Object Game If you are looking for a fragmented object game, this is the game to go for! You are crash-landed on a tropical island, and before you can return home, you have to collect items from the plane's storage and help out to clean up the mess on the island. This game offers you lots of fragmented object scenes in which get pictures of the objects you need to collect, and you have to find the fragments of those objects. This can be a real challenge since many of these fragments are very small and well camouflaged. The game is relatively long and offers lots of different scenes. After you found all the fragmented objects, you need to find in the same scene objects associated with a specific job (like: objects for a musician, a teacher, ...). That is sometimes annoying, since this is far too easy and not on the same challenge level as the rest of the game. There are minigames which are often challenging and which can't be skipped. There is also no hint option for the minigames available - this might be a weakness for some players. But the mini-games are never too hard, so you might need some time with them, but eventually, you'll crack them. For the fragmented object scenes, a "hint" is available in the form of a stone which works like a witching stick: You'll have to go over the whole scene to see where it shines and moves most in order to find it. Fun! Rated 5 out of 5 by MeEnMuHos from Top Quality I played this game long before BFG ever started reviews. It was one of those games that I played over, and over, and over again. Being an older Navy man, an avid scuba diver, and a private pilot, I have always been interested in the "The Bermuda Triangle". As a result I thoroughly enjoyed this one. Very good graphics, testy HOS, and clever story line. I have to say it is one of my TOP favorite HOG games. Rated 5 out of 5 by ntfl from loved it I absolutely loved finding little pieces of objects instead of the usual lists, made me feel the same sort of satisfaction as when completing an actual jigsaw puzzle. Wish it were longer and a little more challenging - I played it a few times and finished in a few hours but was very entertained. Rated 4 out of 5 by arnold1049 from WHAT'S WRONG WITH THIS ISLAND? I played the one hour demo and was sorry when it ended. This game has so many things to do at any given time that you are never bored. A soon-to-be married pilot's plane is hit by lightning and he ends up on a remote island with the plane at the bottom of the ocean. This island is populated by people who seem more than willing to help. It also has a phone, an old-style landline phone that actually works. Kind of stretches the reality of the situation, but who said games should be logical? After accomplishing several tasks, the pilot is able to call his boss and his fiance to let them know where he is and what happened. When his boss hears the name of the island, she is upset. The name means Pirate's Curse. Each location has items to find and items that need to be placed into the scene. The objects to be found are in pieces so each piece must be found to complete it. Once the item is completed, it remains in inventory until the proper place in the proper location is found for placing it. The pieces of the items are well-hidden and I had to use the hint button a few times. It works like a geiger counter; it lights up and pulses when you have found the piece. I never had to wait for the hint to recharge, but that was because I didn't have to use it too often. It had plenty of time to recharge so it was always available when I needed it. Therefore, I really didn't notice how long it took to recharge. In addition to finding and placing objects in the scenes, you also must find 10 or so items that relate to a specific character's business card. The first and only character I ran into during the demo was a sheriff and I had to go through the location finding guns, handcuffs, whistles, etc., objects related to his career. There are lots of business cards. So between finding and placing objects and getting business card items. you return to the same scene several times. There is a map that you can use to move from place to place. Hovering over the map icon brings up pictures of the scenes available for play and you can move to another location by clicking on the picture instead of actually opening the map. 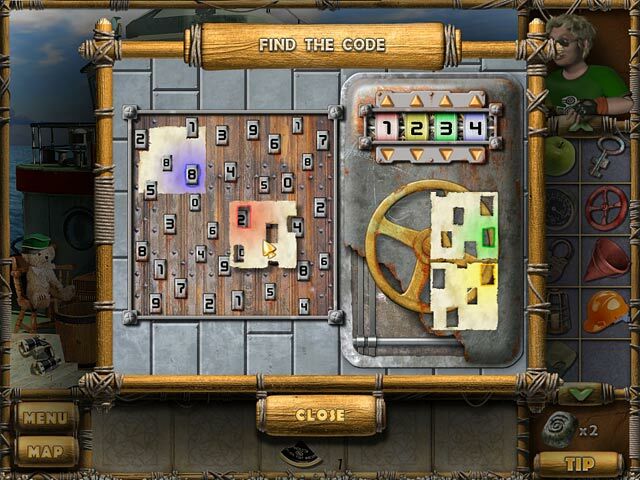 The map shows you how many items must be found and how many items must be placed to finish that location. So you have two ways to move between locations and a lot of information to help you figure out when you need to do something. When you finish a location, it gets a green checkmark on the map. I don't remember being able to set any difficulty levels. This game is a simple, straight-forward HOG and puzzle game. The only options available to change are related to the sound. There are lots of achievements to be won, a lot based on time. The graphics are crisp and bright. I had to laugh at the pilot's graphic. He has blond hair that stands on end and he looks way too young to be getting married, particularly when his wife looks a lot older. This is a delight of a game and a buy for me. There is also a sequel that I hope is as good. Rated 4 out of 5 by gamefan10 from A fun game In this game you are on a tropical island that has a curse. A man is trapped on the island, and your job is to help him lift the curse. 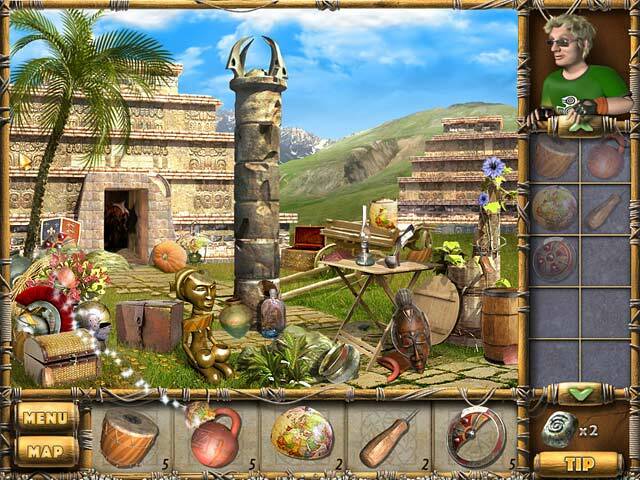 This is a fragmented hidden object game. You need to find all the pieces of each object in order to use that object. For most of the objects, once you find all the pieces, you need to find where to put it. It could be anywhere on the 3 or 4 locations on the map. Usually the area where an object goes will shimmer, so you know something goes there. It's also usually logical, such as putting a pear beside another pear, etc. There are also many mini-games. This is one reason why I gave the game 4 stars instead of 5. One or two of the mini-games are kind of hard, and there is no skip button. Once I had to leave the game and go to the forum to see what to do next. The forum isn't that detailed either, so even when I found the area I needed, the explanation was kind of vague. I finally figured it out however, and felt a sense of accomplishment. Most of the game isn't that hard though - it just takes thinking and trying different things. I really liked the variety in the game - within each chapter you had different kinds of puzzles to solve. I can see replaying this game and still enjoying it the second time. I think it's well done and definitely recommend it. Rated 4 out of 5 by kaera from Nice game Liked this best of the whole series. Rated 3 out of 5 by rosekaufmann from OK BUT I'M NOT EXCITED ABOUT IT Game took me over 5 hours to play – I got an award for that. Story was a little silly, although you don’t find that out until the end. There are 14 trophies (awards), but you’d have to play it at least twice under the same name to get all of them. You can turn tips off and choose your screen resolution. You have to earn 24 cards to finish the game. You play usually 3 locations, a couple of times 4. At each location, you have fragments to find and use. The overview for each location tells you how many pieces of fragments you have to find and how many finished objects you have to use. For me, the 1st two segments of 3 locations each were fairly easy; the 3rd segment of 4 locations was the hardest. The hint works well to find frags by you running your rune over the screen until the frag quivers. Occasionally, objects couldn’t be placed “because it was too early for that.” In other words, you usually had to place almost all objects at all locations before you could place the last objects. You can’t skip puzzles and you can’t do some of them until after most of the objects have been placed where they belong. You may have to resort to the forum for solutions if you have trouble with the puzzles or to find out where things go. After you find the fragments and put the finished objects in place, a magnifying glass will appear over the location button and you will have to find 10 items that belong to a particular occupation. New items will appear in the location which pertain to the occupation. You do this for 24 different jobs to earn the card. The artistry of the people is very poor, although the graphics of items is okay. You can skip through cutscene conversations entirely or hit the “skip frame” button to hurry it along. I lost interest in the story about 1/3 of the way through.